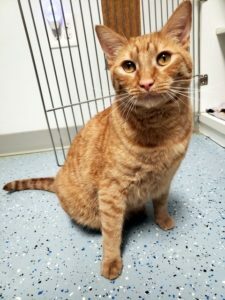 Oscar – Male DSH 2 Years Front Declaw a 2/22/19 – Foreclosed Upon Pets, Inc.
Two year old, front declaw Oscar was found with a fractured rear left leg, July 2018. The wonderful staff and very experienced Dr. Wynn at VCA Black Mt. 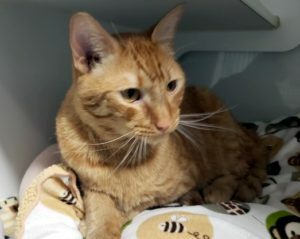 healed and cared for this loving, laid back boy. Doc Wynn surgically placed metal plates and pins in his leg in order to save it. It has been a long road to recovery but he is doing fine and is ready for adoption. He does have a slight limp and may experience arthritis later in life. He also had chin acne, which can be caused by using plastic feed bowls. So glass or metal bowls are needed to keep his beautiful face free of acne. His adopt fee is just $80.00.